MULA series is designed for your child to learn and discover. 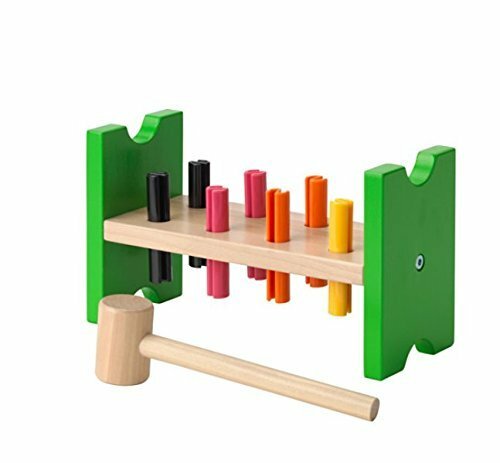 Each part is thoroughly tested, so your child can throw, bang and chew on these toys - they will hold up because play is learning for life. Product Construction Side panel: Solid birch, Acrylic paint Peg board: Solid birch, Clear acrylic lacquer Peg: Polyamide Hammerhead/ Hammer shaft: Solid schima, Clear acrylic lacquer Recommended for children 18 months and older. Includes: 1 hammering block, 1 wooden hammer and 8 plugs. You're allowed to bang as much as you like on this block and when all the plugs are down, you can start all over again. Let your child hammer or push the plugs into the holes, again and again.